+Comment The W3C introduces API standards that end up mostly unused, doing nothing more than loading up the code base with vulnerabilities. That's the conclusion of a paper by University of Illinois, Chicago researchers to be presented next week at the ACM's Conference on Computer and Communications Security in Dallas. While the research – "Most Websites Don't Need to Vibrate: A Cost-Benefit Approach to Improving Browser Security" – which you can find here at arXiv, focuses on Firefox, its findings are relevant across the board. Graduate computer science student Peter Snyder and colleagues Cynthia Taylor and Chris Kanich structure the paper as a cost-benefit analysis of having 74 APIs with which browser authors need contend. 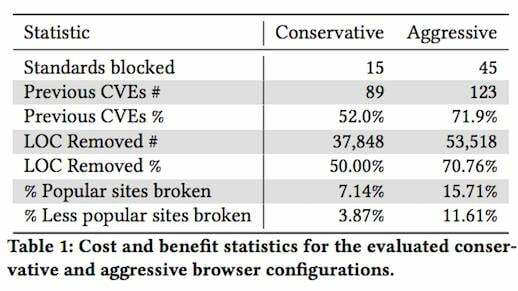 On the benefit side, they measured the proportion of websites that use a feature (thereby making browser support important); on the cost side, they tried to measure the security exposure a feature created. The “cost” side takes a couple of characteristics into account, including the number of historical CVEs associated with a feature (since that hints that it's hard to code to the API securely); and the number of API entry points and lines of code that are associated with a feature, since that indicates more complex code. A search of the Mitre CVE (Common Vulnerabilities and Exposures) database yielded 1,554 CVEs for Firefox since 2010, a decent enough sample (Chrome has had 1,523 in the same period), and 175 of those related to implementations of 39 Web APIs, with 13 related to multiple standards. but makes the user more secure. The results come as little surprise to Vulture South, since over the last couple of years, we've taken a growing interest in the privacy implications of APIs that serve little purpose but to profile users for advertisers. Examples include the Web Battery API, dropped by Apple and Mozilla over privacy fears; the Bluetooth API; a motion sensor API that a smart cookie used to snoop on phones' unlock codes; a risky ambient light sensing API, and so on (for most of these, we're indebted to security researcher Lukasz Olejnik).